Federal Grocers stood on the north-east corner of College St and Ossington, almost like a small size hockey rink. Always in a long, white apron the manager would move up and down the vegetable bins on the right-hand side of the store like a Maple Leaf checking winger of that era. As a paperboy with a Toronto Star route from College to Bloor on Montrose and Beatrice, I appreciated his ongoing hustle with its interminable stops and starts. Once in a while I would savour a visit to buy eggs for my mom at Zucker’s egg store also on the north side of College close to Federal Grocers. Zucker’s inspired museum-like reverie in me. It was a store with nothing but eggs. Like the iceman and the popcorn man this store was about one thing only- a monoculture, a Platonic form. On the south side of College in the middle of the block, The Roxton Bowl was the noisy ying to Zucker’s yang. On one floor there were 10-pin lanes, on another, 5 pins. The building is now a staid medical centre. Most storefronts have changed on College but just south of College St., Fred Hamilton Soccer Stadium has disappeared. A beautiful forest canopy now stands where penalty kicks were once taken. Richard Kuzniak, a former denizen of this neighborhood is looking for pictures of the dearly departed Ball’s Pharmacy, Kohl & Frisch Wholesale, Fass Leather Goods, Jimmy the Blind news agent, Blue Ribbon Stationers or Frank’s Barber Shop. The best haircut Frank ever gave me was for my senior prom in 1965. If you have a picture of Frank’s or any of the other old storefronts mentioned in this article, please contact Richard Kuzniak at zoneiv@rogers.com. 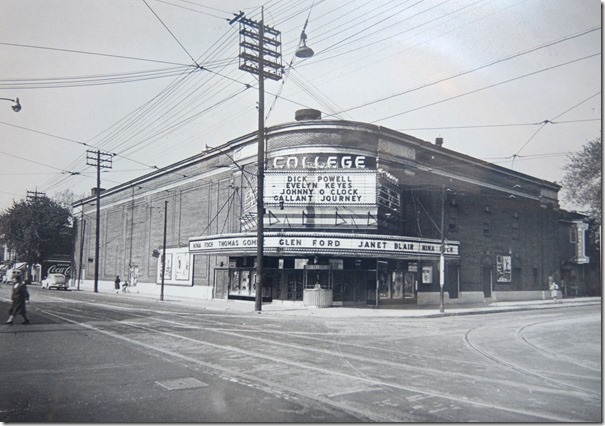 Richard, a retired Upper Canada College high school teacher, is compiling a book of photography featuring College Street of the 1950’s.